A lanky redhead with a shy smile, Kaleb Wilson stands out in his bright green wheelchair. He’s quiet at first. Brittany is his complete opposite. Her personality and energy bubble over. They tease each other while they share their story. Their chemistry is obvious. Like most love stories, Kaleb’s and Brittany’s has had its ups and downs. They were only teens when they met on a mission trip to San Diego. He was a recent high school grad from a small rural Wyoming town. She was a high school junior who lived in Albuquerque, New Mexico. Their long-distance relationship spanned many states and years. She went on to college; he went on to the Coast Guard. They broke up. They got back together. In November 2012, one month after they had reunited, their relationship was put to the ultimate test. Kaleb had just marked his third year serving in the U.S. Coast Guard in New Orleans. He was preparing for the next big step in his career — attending the Coast Guard’s competitive AST “A” to become a U.S. Coast Guard rescue swimmer. A $100 bet changed his life forever. On November 10, 2012, Kaleb was dared to jump off a pier while at a festival with friends. He says that, as a typical 22-year-old, he didn’t hesitate to dive in headfirst. He hit the bottom, shattering his C6, C7 and T1, sustaining a spinal cord injury. He was taken to the Level 1 Trauma Center at Interim LSU Public Hospital at New Orleans. “The original surgery was supposed to take two hours and it ended up taking five. It was a lot of panic for everyone. Why hadn’t we heard anything? Why is he still in there? Is he OK?” Brittany recalls of the day she received the worst call of her life. The first few days in the hospital were grueling. Brittany was with Kaleb’s parents at his bedside. She says some of those first intense days were spent figuring out where she belonged in Kaleb’s bigger picture. Kaleb arrived at Craig Hospital during the week of Thanksgiving. For Brittany it was an eye-opening experience. “It’s hard to find something to be thankful for when you first get here. It was hard to be away from family. When you first get here you’re surrounded by wheelchairs, and that’s not what you want your life to be,” she says. They faced a tough reality, not sure of what Kaleb’s future held. Brittany says they eventually became part of a larger family. “It’s hard and scary when you’re new. You never know where life will take you, but it’s definitely enchanting when you’re in it. From the outside looking in, you never understand — but from the inside looking out, you never want to leave,” she says of Craig. 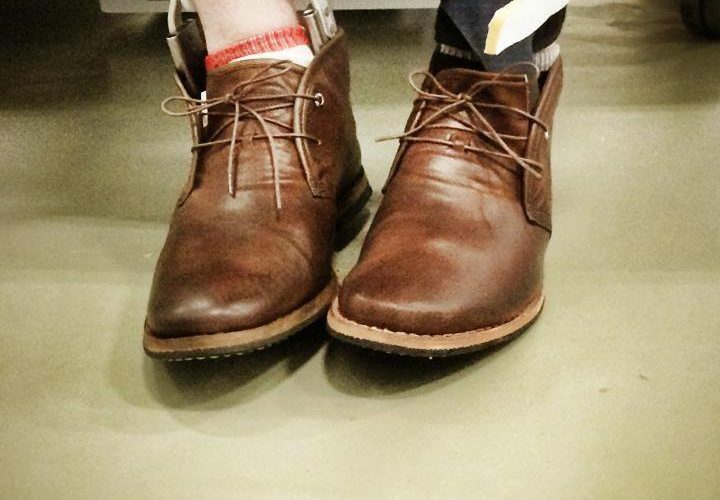 Kaleb’s wedding shoes for the couple’s “rustic romantic”-themed wedding fit in his braces. He practiced walking with them with his therapists months prior to the big day. “She really pushed me to do things I needed to do. Especially through the wedding, being there, being the main reason I wanted to walk her down the aisle. 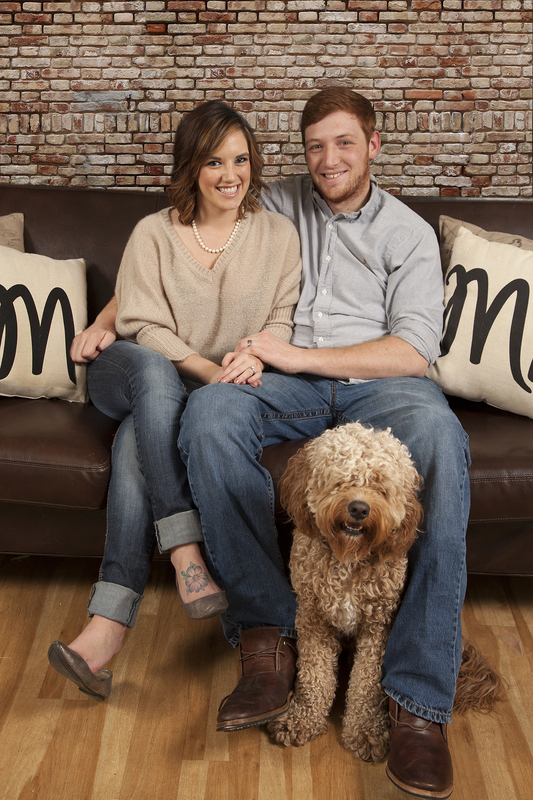 Just there for a lot of moral support when things weren’t easy,” Kaleb says. “He always was [himself]. I don’t think we ever skipped a beat. I made sure we spent a lot of time as the two of us. It was hard and I was angry and frustrated. Why us? He was always so positive and laughing. Who does that? It’s weird!” Brittany says as she grins at her new husband. 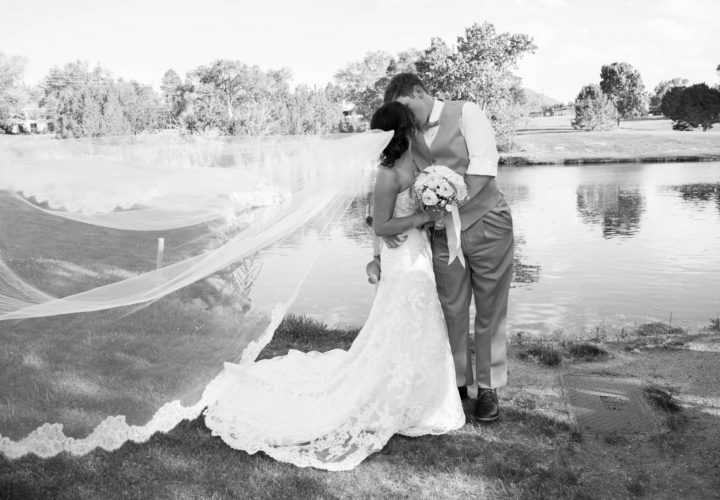 Kaleb and Brittany were married in June 2014. A teary-eyed Kaleb stood at the alter and walked his bride down the aisle. 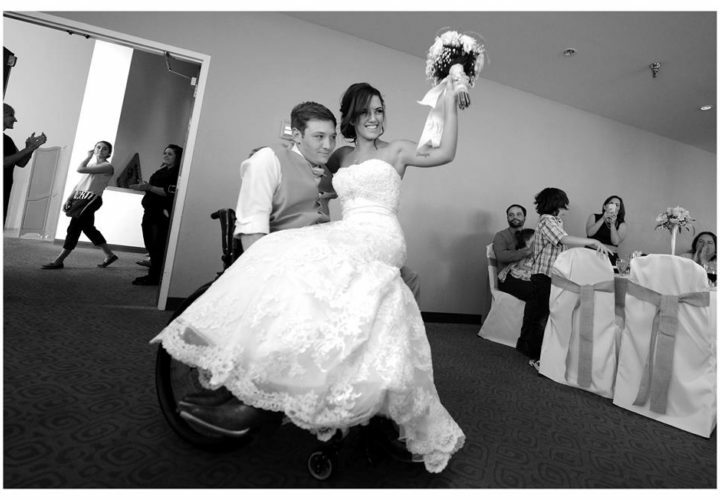 Standing and dancing at the wedding became his rehabilitation goals. 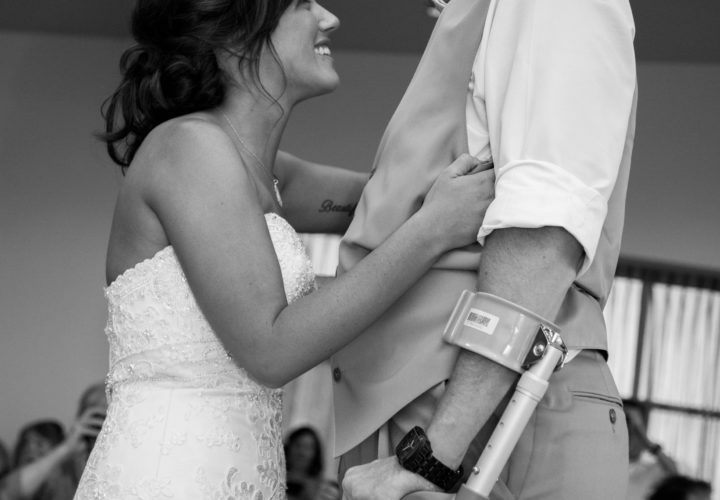 Kaleb’s NRN team customized his therapy with the wedding in mind. The two danced together on their wedding night. April 2013 was a big month for the couple. Kaleb had recently completed his rehabilitation at Craig and was accepted into the NeuroRecovery Network (NRN) program. He also proposed to Brittany. 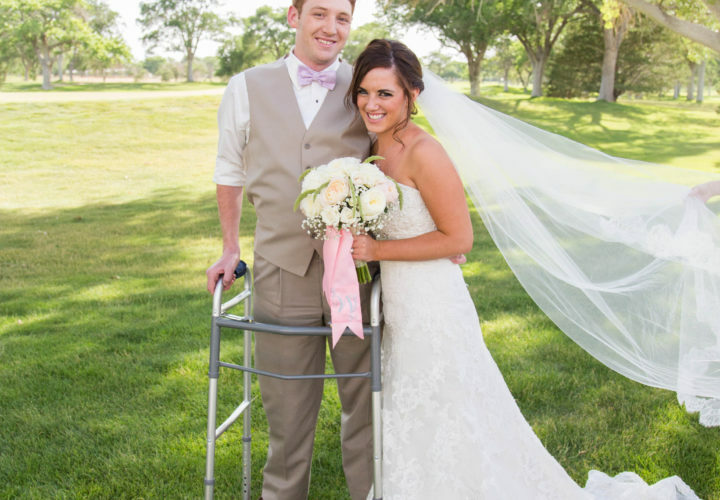 Standing and dancing at the wedding became his rehabilitation goals. 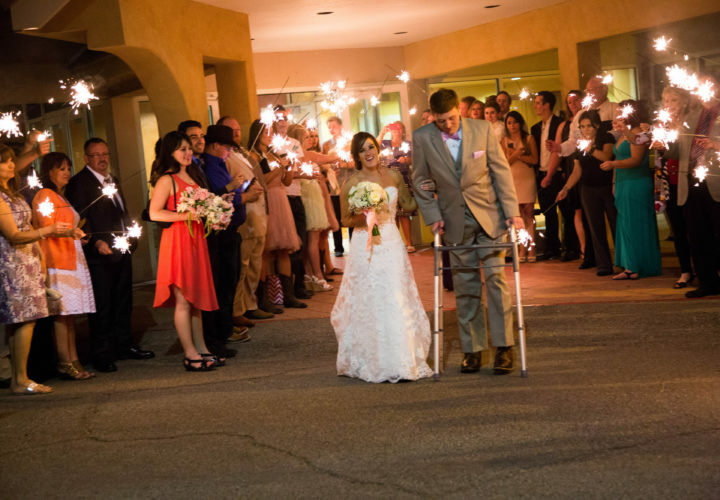 Kaleb’s NRN team customized his therapy with the wedding in mind. He even tested his wedding shoes during therapy. 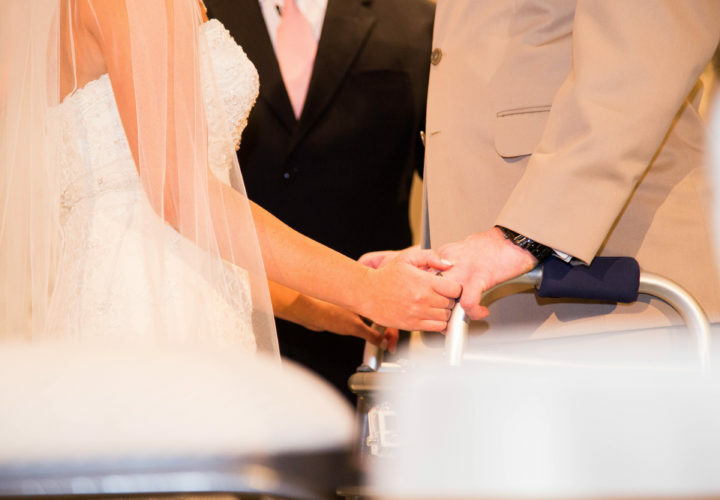 In June 2014, a teary-eyed Kaleb stood at the alter and walked his bride down the aisle. The two danced together on their wedding night. Kaleb completed his 200th NRN session this year and is now doing outpatient therapy at Craig. The couple says college and house-hunting are in their near future. Like all newlyweds they are excited about what’s on the horizon. They realize there will be challenges, such as having children, but together they are ready. Kaleb started working at Home Depot in October. Kaleb completed the NeuroRecovery Network (NRN) program at Craig in 2014. NRN is an outpatient intensive therapy program designed to improve functional mobility, independence and quality of life through physical and occupational therapy for people who have sustained spinal cord injuries. 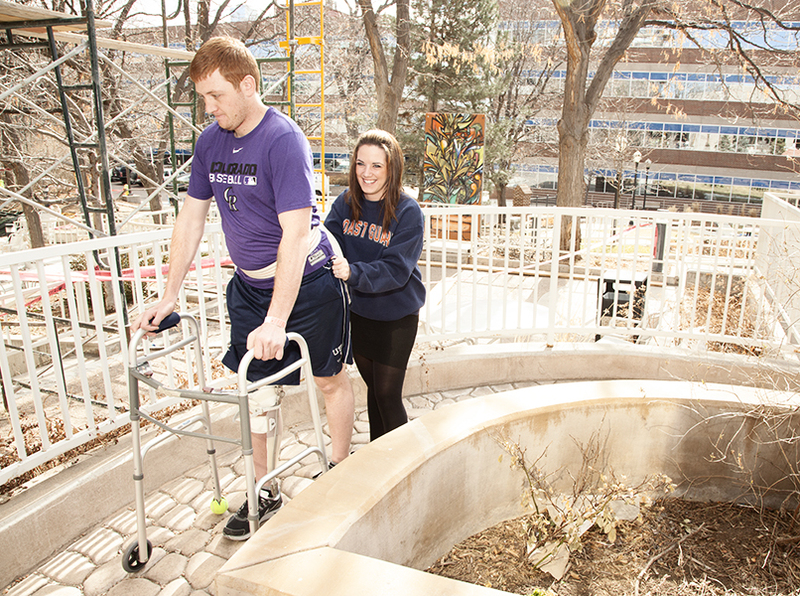 Craig Hospital joined the cooperative network of six cutting-edge rehabilitation centers across the nation in 2012. The NRN is part of the Christopher & Dana Reeve Foundation (in partnership with the Centers for Disease Control and Prevention) and was founded in 2004 to translate the latest scientific advances into effective, activity-based treatments. Craig Hospital has a special staff of dedicated professionals who received specialized training in order to deliver standardized treatment.